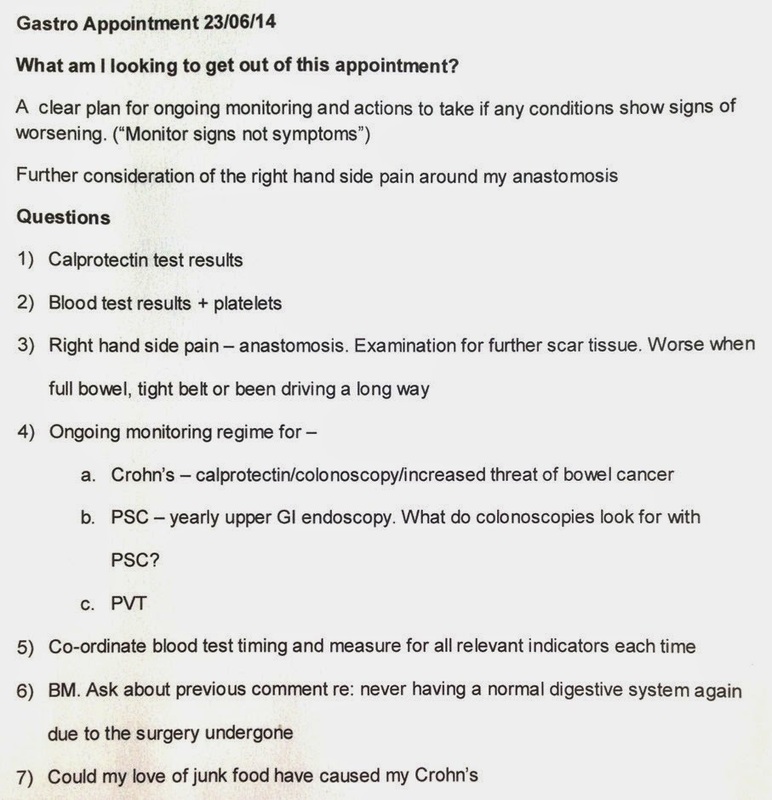 Guy's Hospital - Monday 23rd June 2014 - Time for another appointment and two things to come away with : some comfort on what is causing the ache around my anastomosis and to agree a long term monitoring plan for the conditions I suffer from. I prepared the list below to take with me. Having arrived in plenty of time I knew there would probably be a long wait ahead as I specifically asked to see my usual consultant rather than a registrar. After a while one of the nurses announced that they were running around 45 minutes behind schedule but it was actually an hour after my allotted time that I heard my name being called. My consultant apologised for the delay. His previous patient had been are particularly difficult case and couldn't be hurried. I had noticed this guy in the waiting area and he did look extremely poorly. In the space of around twenty minutes we covered a wide range of subjects and I have tried to capture them, as best I could, for future reference. They may answer some other patient's questions or prompt a few others. Into the consulting room - I took out my list and we started. Firstly, what did the calprotectin test from a month ago show? The result was 73, slightly higher than before but on the overall scale of possible results still low. Nothing to be concerned with and no indication that the Crohn's was returning. He explained that a new study had been carried out into the correlation between calprotectin test results and assessments by colonoscopy, specifically looking at the anastomosis and the prediction of Crohn's recurrence. The study has not been published yet and he couldn't find a draft on his PC so he took a piece of paper and drew from memory a graph representing the results. Rutgeert's Score on the X axis; calpro on the Y axis. Apart from a few "rogue" points the calpro results closely agreed with the visually assessed Rutgeert's score. (Rutgeert's is a scoring system used with a colonoscopy in which the consultant assess likelihood of recurrence based on what he sees). We then turned to the blood test results. 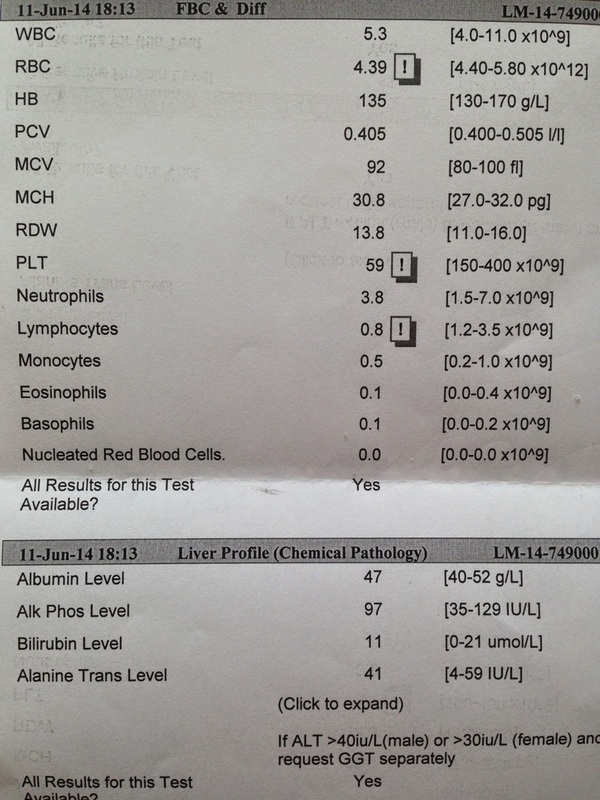 Liver function test - OK, CRP - OK, Hb = 135 but platelets = 59, the lowest ever. He asked me if Haematology were particularly concerned about this low count to which I replied "No". So we parked that one. (Will mention it to my haematologist when I see her later in the year but she has told me not to get hung up on numbers, it's symptoms that you should look out for). I mentioned that on a couple of occasions recently I had had to rush off to the bathroom when travelling and luckily had made it OK, but only just. My digestive system was very variable, ranging from normal to urgent. Back in December he had made a cooment that, because of the surgery I had undergone, my digestive system would probably never return to normal. I queried how the removal of just 14cm of bowel would affect it so much. He agreed but it wasn't what I was missing that had prompted his remark, more the effect of a surgeon having been in and rearranged my guts. (Thinking about it subsequently, the operation in October 2010 was not simply to remove a stricture but to sort out internal fistulas and loops that had formed. The operation took four and a half hours and the surgeon described it as "one of the most complicated and enjoyable" that he had carried out). The way his phrased it will always amuse me). Urgency seems to be worse on work days when I know I needed to get to the station by a certain time or I won't get parked and will then miss my train. I wondered if this was a form of stress that was making it worse. He replied that stress was widely known to affect the digestive system so it was very likely a contributory factor. We then discussed the psychological aspects of Crohn's which can have a very marked effect on patients' lives. He had some patients who were now afraid to go on the Tube, for instance, as they had had a bad experience and were not prepared to risk it again. I mentioned that I seem to have been building up a reaction to phone calls. Within ten minutes of starting to talk to a friend on the phone I am often desperate to go to the bathroom and it seems to have become self-fulfilling. Must try and break myself of this. There is no logical explanation for it. There is a theory that the ileocecal valve plays a part in slowing down the digestive system and acts as a break point but in his opinion this was groundless. (BTW - I lost my valve along with the stricture). However, it would be worth having a bile acid malabsorption test carried out as this can affect the speed at which matter passes through the gut. The test would involve swallowing a radio active marker, then having an x-ray. A week later a second x-ray would be taken and the two results compared to assess how much marker was left, or had been re-absorbed. Another new experience, something to learn from. He filled in the request form and hit the send button. "Diagnosis of bile acid malabsorption is easily and reliably made by the SeHCAT test. This nuclear medecine test involves two scans a week apart and so measures multiple cycles of bile acid excretion and reabsorption. There is limited radiation exposure (0.3mSv). Retention of SeHCAT at 7 days is normally above 15%; values less than 15%, 10% and 5% predict respectively mild, moderate and severe abnormal retention and an increasing likelihood of response to bile acid sequestrants. This test is not licensed in the USA, and is underutilized even where it is available." Ongoing Monitoring - I had read that Crohn's disease gives an increased risk of bowel cancer and wondered whether this was an argument for having colonoscopies rather than calpro tests. His explained that the increased risk was due to inflammation. My last two colonoscopies, and now the calpro tests, showed that I was clear of inflammation. We then moved on to PSC (Primary Sclerosing Cholangitis) for which I have a yearly upper GI endoscopy, looking for and treating esophageal varices. I had seen on the PSC support website that many sufferers had a colonoscopy as one of their monitoring measures. I wondered what it was intended to show. He said that PSC does give an increased risk of cancer so suggested that we review the colonoscopy question at the next appointment in six months time. It would then be two years since my last scope and it might therefore be worth scoping again. I didn't ask the question about harmonising blood tests. That's something I can manage myself. Parting Shot - I couldn't resist asking a final question prompted by last week's "media does Crohn's and gets it wrong - again" story. "Was my Crohn's disease caused by eating junk food?" I won't use his exact reply but the gist of it was that this foundless claim had caused much damage and upset amongst both patients and gastroenterologists ie. the general IBD community. He was attending a gathering of GI specialists when the story broke. They had then been inundated with requests from the media to do interviews...but "Junk food causes Crohn's" is a much more arresting headline than printing the truth. ...... and as for the 300% increase in hospital admissions for young people with Crohn's. Whilst there is undoubtedly an increase in the number of cases being diagnosed it is not the reason for the 300% figure. That can be explained by the use of modern drugs that require infusions, such as Remicade, or treatments such as iron infusions that each count as a hospital admission. His frustration was very apparent. And that was it - my next planned appointment should be in the lead up to Christmas. In the meantime he asked me to contact his secretary once I had had the bile acid malabsorption test to get the results. I will admit to coming away from Guys with a slight spring in my step if for no other reason that it is so good to find a consultant that considers all the aspects of your disease and is willing to take the time to discuss them with you. It was worth the one hour wait. I was also reassured by his comment regarding cancer risk and inflammation, and of course the fact that, at present, the Crohn's seems to be held at bay. I just have to accept the ache in my side is not an indication of something more serious and I can get on with life with added vigour.